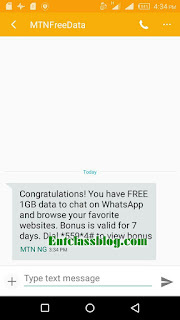 MTN NG is currently giving her subscribers 1GB free data to browse their favorite sites and as well chat on WhatsApp all for free. Seems MTN NG is in the season of rewards, as they are still giving out 100MB free data when you download and install MTN MyApp application. It's quite interesting as other networks are also in the season of rewards. Glo is still giving out double data bonus called Oga SIM to subscribers, and also 9mobile 4.5GB data for just N500. 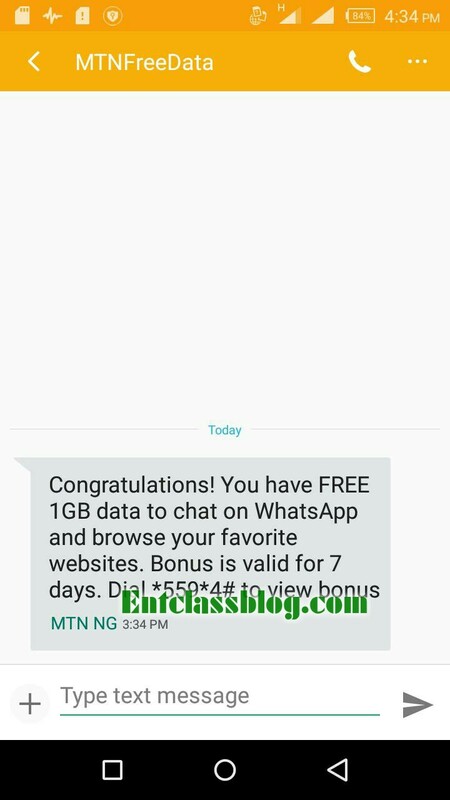 If you received this type of text message from MTNFreeData, then you are lucky. But if on the offchance you didn't receive such, then dial this code *559*4# to check your data bonus to confirm if you have been given or not. Bonus is valid for 7 days, and data can be used on any internet enabled device. Kindly leave a comment below if you were given or not. tried 4 sims, no show yet. guys pls how did u get urs? You don't have to send any code to get the data. I have explained everything in the post. Every body just dey enjoy. Why me? Doesn't got this offer any help admin? you don't have to do anything. I have explained everything in the post. Okay I downloaded the MTNmy app and I got free 100mb, so am asking if its still possible to get the 1gb free data since they gave me 100mb.